Earlier this year I traveled to Tokyo, Japan where I met Sana Takeda the widely acclaimed artist of X-23 and Monstress, her upcoming Image Comics debut with writer Marjorie Liu. 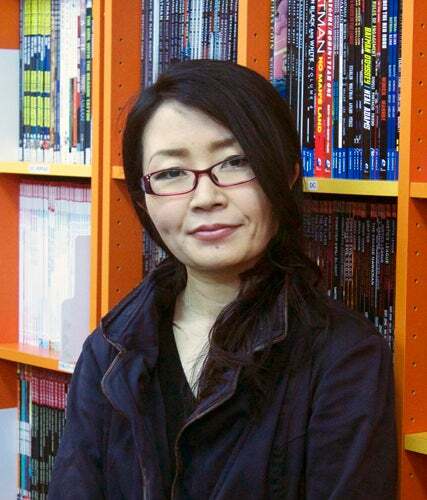 Takeda has seen widespread acclaim for her work on the former series and previews of the latter have left fans salivating. She took time to speak with me along with the assistance of her agent Aki Yanagi, acting as a translator and Alex Janky as photographer. Read the full interview here, providing some insight into the process of this artist, and the changes she's made to her style for the new project. 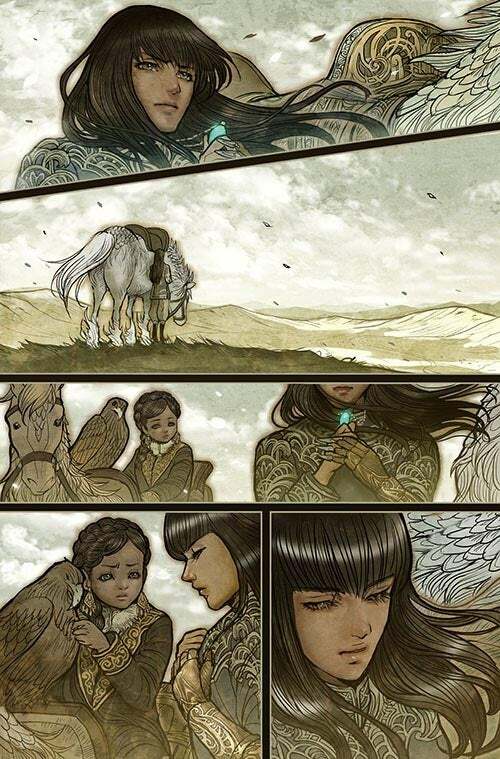 Also, be sure to check out six pages from Monstress #1 at the end of the interview. 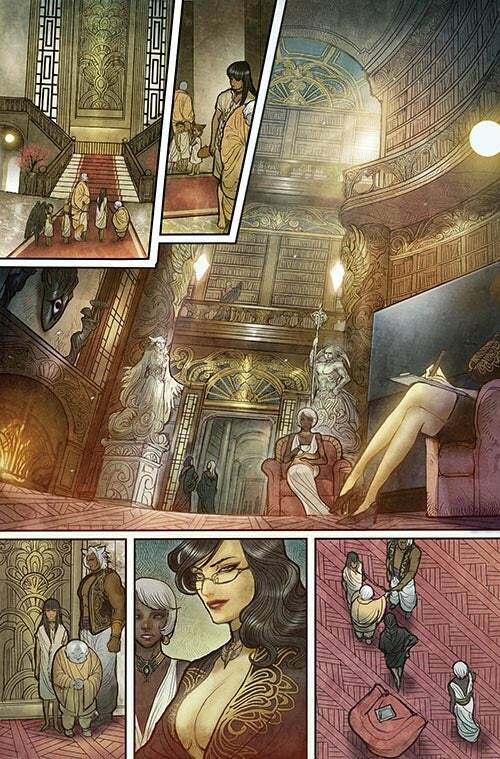 When Marjorie Liu first announced Monstress at Image Expo in January and a few of the images you had provided were put up on the screen, there was an audible gasp that ran through the audience. People, myself included, were very interested in what they saw. How were you first introduced to the concept of Monstress? Sana Takeda: Marjorie and I worked together on X-23 about three years ago. After the run ended, we remained in touch. I really liked working with Marjorie and wanted to do so again. Last year Marjorie was here in Japan and we went for lunch to talk about some ideas. It was an informal thing though and I didn’t expect something to come from it. Later that summer though, Marjorie e-mailed me and asked if I would be interested in working on a project together. That was the beginning of Monstress for me. When you and Marjorie speak about collaborating, you’re obviously very fond of one another. What is it specifically that you appreciate about working with Marjorie? Takeda: When I worked on Marjorie’s scripts for X-23, I was able to understand what she wanted, not just the images, but the feeling of the story. We share similar feelings on the script and work very comfortably together. I do not speak English, and Marjorie does not speak Japanese, but we still communicate in a very special way. It may sound a little strange. Aki Yanagi: Even when I am traveling with them and have to translate, I will have to leave to go to the bathroom or order drinks, but they still communicate while I am away in a unique method. From my point of view, they have a special bond. They feel together and that makes them special. Do you think that might come from working in comics, which is primarily a visual medium where images can transcend language? Takeda: I honestly don’t know. I would like to know myself. When I work on Marjorie’s scripts, it is like I am having a conversation. I do not know exactly what Marjorie thinks, but we find out together. It sounds like you share a very unique partnership, rather than just approaching even your previous corporate work as simply being work. 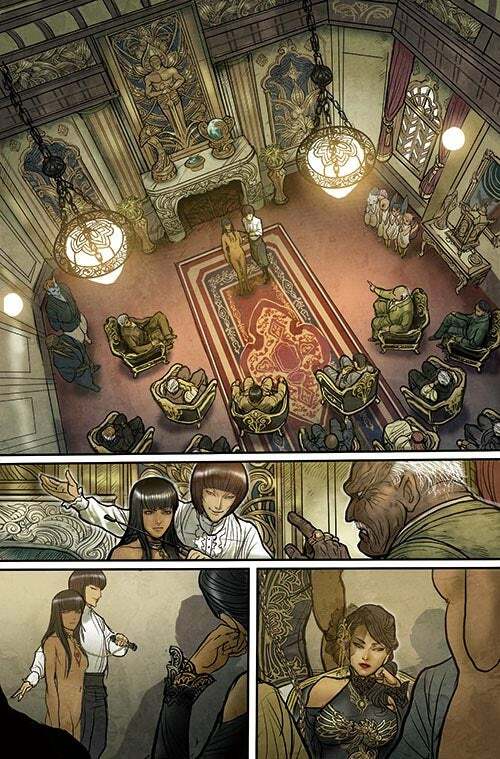 Returning to Monstress, what was it that first attracted you to the concept? Takeda:Monstress is a new challenge for me. It has to do with the kaiju and monsters. I was surprised to hear that was what Marjorie was thinking about, so I wanted to know what she was thinking about. When I heard that you would be drawing kaiju, I thought of an issue of X-23 that featured a shark tank. There are these massive Great Whites tearing people apart, but there is a grace and majesty to them as well. That approach to these terrible creatures has me interested in how you are designing the kaiju in Monstress. Takeda: The monster itself is the center of the story, so there’s not much I can say at this moment. I am not sure how all of the monsters and kaiju will appear quite yet. Marjorie has moved into a new genre in her career, so I would like to push myself as well. I want to betray my art style and do something entirely new. Hopefully, that new style will be something that readers will respond to and enjoy. That shift in your art style was apparent in what was shown at Image Expo. They’re gorgeous, but also reflect a very different approach. What are you trying to do differently to push yourself? Takeda: When I was working on Marvel books, I was doing my best and it gained me many fans. So I don’t want to deny what I did in the past. After finishing X-23 though, I wanted to rethink my art style. I like to think of it as a diet for my art, where I am taking away the things that are not needed. There is a need to balance that with making something new and interesting to see too. It has been a challenge for me. 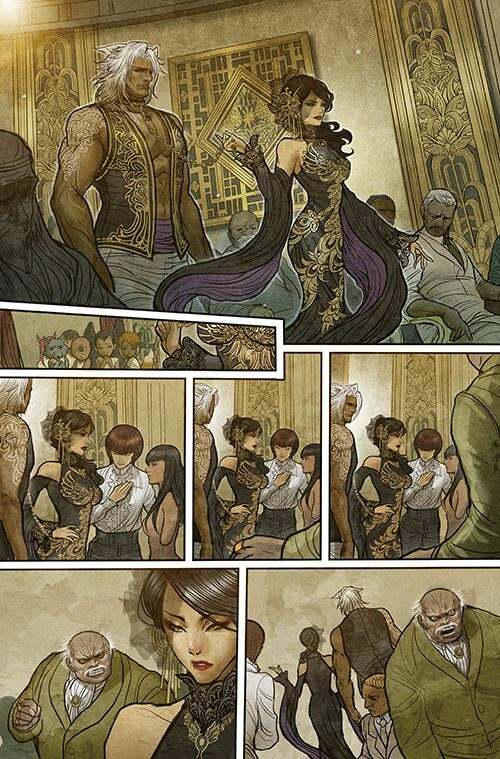 One more new thing with Monstress I’ve noticed is that the story occurs in a historical setting. It will take place in Hong Kong after World War I. How have you approached the challenge of creating locations and details from history? Takeda: I am having a lot of fun drawing these backgrounds, but it is not really based on history. Monstress is based in an alternative history that still occurs in the 1920s, but with some big changes. With monsters and magic, it’s not exactly true to life. I will be careful to observe some details, but I am also trying to create something new. Were there any specific points of reference you used to design Monstress or develop your new style for the series? Takeda: When Marjorie and I first began to talk about Monstress she sent me a lot of images to possibly use for reference. After only looking at a few, I stopped. The art is very much my own design and I want to make it something unique. We’ve been talking a lot about all of the ways in which you are challenging yourself with Monstress. The series has been announced and the first issue is planned to be released this year. Now that you’ve had some time to work on that issue and have received a response to some of your new art, how are you feeling about the project? Takeda: Some readers may know that Marjorie’s scripts have a lot of detail and depth. Even when I was working on X-23, I felt pressure working on her script trying to capture all of what was there. I am still in the middle of the first issue, but I am doing what I can to show as much of the story as possible visually. In fact, I’m still looking forward to seeing what the completed issue will look like when it is ready. 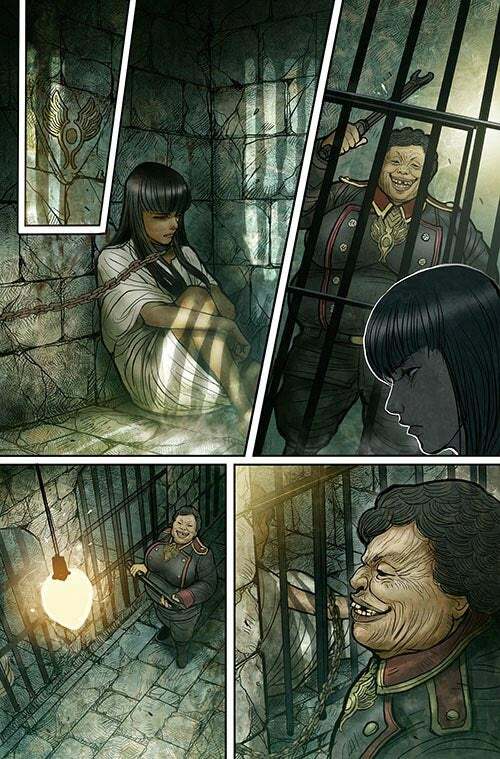 You’re changing a lot of what you’ve done in the past, but Monstress does share some connection with X-23. It features a young woman who is feared, hated, and manipulated by the people around her due to being unique. What about this character-type and themes appeals to you? Takeda: The character herself may be special, but the core of the character is something I think anyone can relate to. All people suffer from some sort of pain or distress in their everyday lives. There is something that all readers can share in common and relate to, whether they’re men or women, children or adults. That is very special to me. It is not about what the character is, but the inside of the character. Special thanks to Aki Yanagi who provided translation for this interview and Alex Janky who provided photography.